The Islamic State (ISIS) seems to have focused its beam on the 2018 FIFA World Cup in Russia as Paris Saint-Germain’s Neymar and Barcelona star Lionel Messi have been seen in a horrid poster that can easily send a shrill down anybody’s spine. In one of the horrifying photoshopped images – which has gone viral on the internet – a terrorist can be seen standing behind a crying Neymar on his knees with his hands tied behind his back beside an ISIS flag while Messi appears to have been executed. 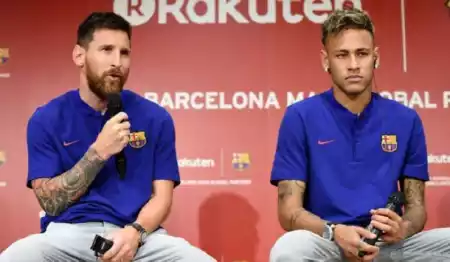 There has been no response to "ISIS Issues Chilling Threat To Messi, Neymar Ahead Of 2018 FIFA World Cup In Russia"